Posted on 01/30/2019 Are you in the market for car insurance? Even if you're not you should read this! (Cause maybe you should be). Posted on 11/09/2018 After an accident in DC, MD or VA, how do you know whether the insurance company will pay you a fair settlement? Injured in a D.C. Crash? Get a FREE Car Accident Guide Book It is normal to be unsure of what steps to take after an auto accident. This is why we want you to have this free guide book to help you protect your rights. This morning, the Washington Post, reported that a metro bus crashed into a wall along 16th Street in N.W. DC. The accident took place after 5:30 a.m. this morning in NW DC. It's reported that the metro bus collided with another vehicle on the road - it's not clear how the accident took place, but the article is reporting that one of the vehicles ran up on the sidewalk and hit a tree and a lightpost. The article has picutres of the metro bus right after hitting the wall. In the aftermath of the accident, the southbound side of 16th Street near Underwood Street was closed as a result. Luckily, DC police confirmed that although there were four passengers on the bus at the time, none of them have reported serious injuries. Accidents can happen on the beltway, GW parkway, memorial bridge or on I-66. Especially during rush hour, our city has a lot of vehicles and even a lot of pedestrians out on our roads. That's why it's important to stay safe and protect your rights, in case something like this happens to you. For example, if you are a pedestrian that's been in an accident on the road, or if you're injured in a hit and run, we can work to get you the benefits you deserve, starting with a free initial consultation and contigency fees (you only pay at the end and if we win your case). Before that, check out our easy-to-read and informative ebook on accident cases in D.C., Maryland and Virginia - there are tips that will avoid you paying all of the costs of an injury that was not your fault. 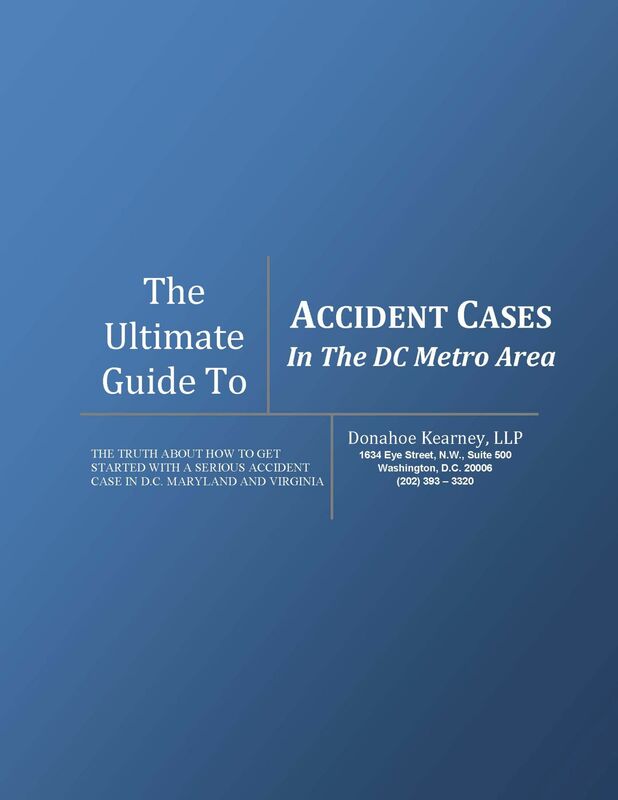 You can give us a call at 202-393-3320 and we can send you a copy of this e-book that will help after you've been hurt in a car accident in D.C., Maryland or Virginia. It will give you tips on whether to give the other driver's insurance company a recorded statement, what to do when dealing with the insurance company, whether to use your health insurance to pay for your medical treatment, and more.